So I’m sitting here drinking a coffee channeling my inner Jace, wondering about a lot of things. No, not who’s going to win in Vancouver. I’m thinking about next year! While this Pro Tour is going to be pretty great because Wizards of the Coast finally decided to purchase a globe (A summer Pro Tour in Canada makes a lot more sense seasonally), but it also is going to lead us into a huge announcement for the following year. According to Helen Bergeot (Director of Global Organized Play for Magic), the 2016 Grand Prix schedule is going to be announced at Pro Tour Magic Origins (Source). This is a great time to start planning for next year’s fun but it also entails another announcement. 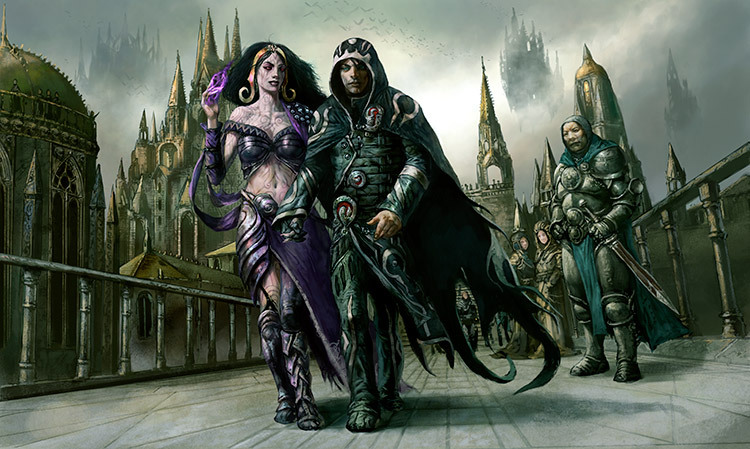 For the last eight years, Wizards of the Coast has been giving out a free promo card to everyone who enters the main event of a Grand Prix. The first two promo cards were nostalgic at best. Call of the Herd and Spiritmonger are two great green cards from “back in the day” but have aged poorly in today’s standards. The next two kicked it up a notch and currently sit on the Modern ban list. Chrome Mox and Umezawa’s Jitte are definitely powerful cards but Wizards missed the mark again. The next card is one I’m not terribly familiar with at the time it was released. I had taken a break but I can only assume a new art Maelstrom Pulse was well received by players. The year of 2012 was a deviation from the old promo schedule. Two promos would be released that year and got an approximate even number of GPs. Clearly the limited amount of these promos caused them to not positively affect the price of the cards. Goblin Guide promos sit at almost even footing to the pack foil. This is typical of under printed promos that are in high demand (similar to pack foil Tasigur vs pre-release Promo Tasigur). Another year of this weird split schedule had Primeval Titan splitting a year with All is Dust. Both of those promos I’d consider bargain bin despite their phenomenal art as they were once again paired in Modern Masters 2015. Evidently someone at Wizards noticed the boom of players was having a really big impact on the price of mythics from the previous years. Batterskull was announced as the promo for entirety of 2014. Despite being announced as a promo and falling significantly, eternal play brought this card up to $30 before a price dent was really made. Although some of the price points on this are a little messed up, you can still compare it to today’s promo price. The promo price is almost exactly in lockstep with the regular non-foil. This clearly demonstrates that the saturation level has been met. The sheer number of competitors at Grands Prix have been able to saturate the market with just enough Batterskulls to cut the price to something bearable. Now, the price could also be influenced by Stoneforge Mystic decks falling out of favor in Legacy and Kolaghan’s Command popularity in Modern, but that is likely more of a factor for it not increasing. 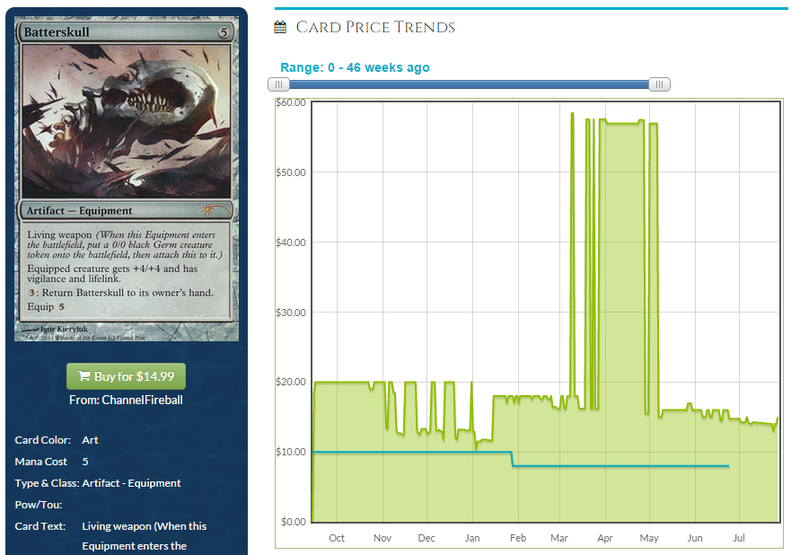 It’s been almost a year since Batterskull was the GP Promo and it’s price hasn’t wavered since it’s low. What did Griselbrand do? Pretty much the same thing as Batterskull. 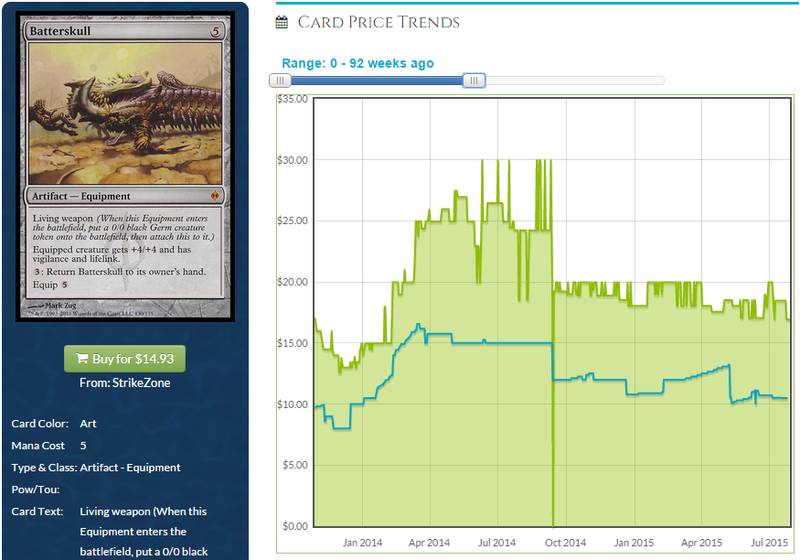 After reaching peaks of $40, Griselbrand has been on the steady decline to a more managable $20. It is another small spring set mythic (printed an entire year after Batterskull) that was quickly climbing out of control. What we can see from this is there really is no upside to holding anything that becomes a Grand Prix promo unless you really like the art. And now to my point, with the announcement of next year’s Grand Prix schedule, we’ll also probably get an announcement with the year’s Grand Prix promo card. It’s important to consider how this will affect your collection and what you should do to prepare. The trend has been pick a successful tournament staple Mythic from the last set of the block that rotated out of Standard 2 years ago. If the pattern of the last two years of Grand Prix promos is to be followed, we will get a card from Dragon’s Maze. Unfortunately, Dragon’s Maze is a miserable set. For argument’s sake, there are really only two cards in the whole set really worth discussing. 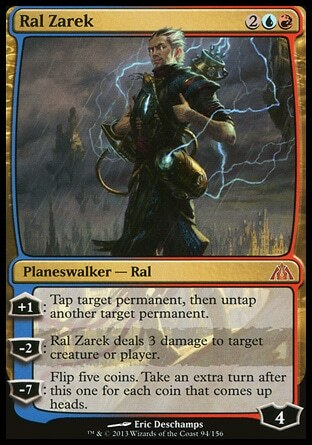 As much as I would personally love an alternate art foil Ral Zarek, I doubt he will be the Grand Prix promo. He’s not a competitive card and Wizards has shown reluctance to use those as Grand Prix promos. Voice of Resurgence would make sense as a Grand Prix promo. At a fair trade value of approximately $25, I wouldn’t be surprised to see him hit $30 before being the promo. It would be a very similar trajectory to Batterskull. But that alone doesn’t make him a slam dunk. Really it’s anyone’s guess but I have a few theories on what may happen. Return to Ravnica block was opened in such huge quantities it’s hard for anything in the set to truly command a high price. The 10 shock lands take a lot of the value away from other cards. 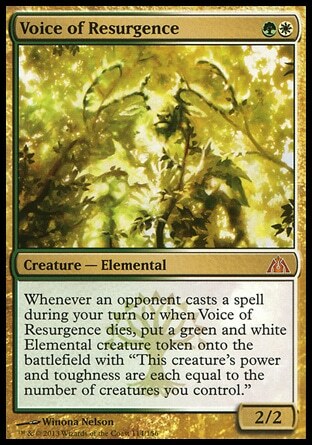 It’s possible to keep Voice of Resurgence’s price from tanking completely that they do another split year of promos with Ral Zarek and Voice of Resurgence. Another possible outcome is another card from Innistrad. There are many possible reprint targets at rare like Snapcaster Mage and Cavern of Souls and mythics like Huntmaster of the Fells, Liliana of the Veil, and Craterhoof Behemoth. I’d say your Liliana’s are likely safe as they are the RPTQ promo. Snapcaster Mage might be the prize they save for the next Modern Masters. So really, what I’m trying to say, is it’s really anyone’s guess. Just don’t get caught with your pants down. But what about the Pro Tour!? Well this is kind of a stale Pro Tour. There is probably money to made by speculators but there’s not a real reason to invest in a ton of cards that might not be good in a few months. The Rally the Ancestors deck looks good now but after they lose temples, Satyr Wayfinder, and Mogis’s Mauraders, how good is the deck anymore? Even Thopter Spy Network and Hangarback Walker have room to fall when Darksteel Citadel rotates out. I could see them printing Abrupt Decay as a Grand Prix promo foil. Nobody would dislike getting one and it could even drive attendance as a $60 card (before drop) is basically worth the event entry. The price of a regular abrupt decay isn’t that high. It would be more akin to printing Olivia Voldaren as a GP promo. 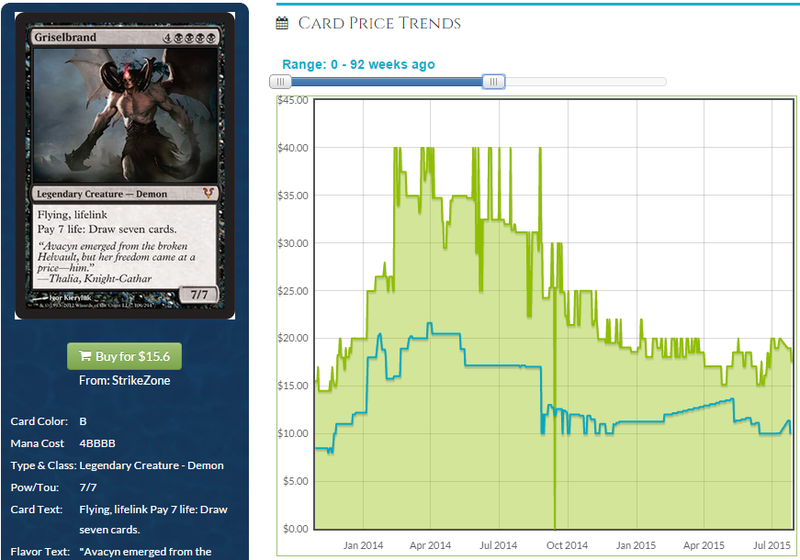 The price of the GP promos also tends to be most similar to non-foil copies for year long releases. I could see huntmaster as one after jund returned to favor. I myself off loaded a lot of new plans walkers at the Dallas GP but wish I could of picked up some Jaces. A lot of players and some of the pro teams were also sold on that guy. Either Huntmaster or Olivia would seem reasonable with their price spike. Cavern, Snap, and Voice all seem like they will be saved for MM 2017 if wizards keep the 2/yr track record of releases these sets.